B.O. 's adviser for faith-based initiatives continues his anti-Catholic bigotry. This guy needs to go. Will we witness another bloody revolution in Iran? There is Hope for Change in Nevada. It's coming Nov. 2, 2010. Your Majesty, the peasants are revolting! A little wake up music for you farm boys and girls out there. I have no idea what this pic means or why it was taken. . .if you laugh at it, you're strange. LOL. Beware of Dog. . .he thinks he's Rambo. The inexplicable. Ummmm. . .I dunno. . .you tell me. John Allen reports on his participation in a recent panel discussion at the University of Dallas. The discussion topic: "The Identity of a Catholic University." Oddly, Mr. Allen contrasts "intellectual openness" with "religious orthodoxy," as if one cannot be both open and orthodox. Of course, what "openness" means to the Tolerant Crowd is a dogmatic adherence to leftist ideology, deviations from which result in swift prosecution and punishment at most secular universities. So, yes, it's true. . .one cannot be intellectually open and secularly orthodox. Now there's a pink Ouija board. . .just in case you want to introduce your daughters and granddaughters to the practice of occult divination. And just in case you DO want to introduce them to such things: DON'T! Marketed as a parlor game, the Ouija board is anything but a game. It's a doorway to Something that no sane person wants to play with. Even if you reject the notion that divination is a way of invoking demonic forces (whatever they may be), and even if you reject the notion that there is any such thing as demonic forces, divination of any kind taps into the human unconscious and brings to the surface images, patterns, forces, ideas, passions, etc. that are unconscious for very good reasons. Chief among these reasons is the tendency of the human mind to shape its understanding of the world around the complexities of daily experience. Guided by right reason, the mind is capable of rational deliberation, of weighing options and calculating consequences for self-preservation within the proper bounds of Right and Wrong. Once we have opened ourselves to our more primitive impulses and passions, reason quickly begins to look more and more like a nagging restraint rather than a guide. And what is left to guide us then? Predator instinct? Power? From a Christian perspective, occult divination is the outright rejection of Divine Providence. 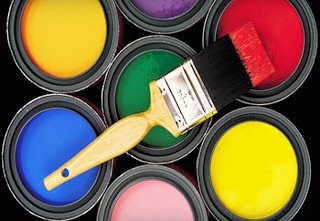 We don't need to know the future (if such a thing is possible) b/c we trust in God's promise to provide and care for us. All we need do is give God thanks for all the blessings He has already given us and do what is Right. If you own a Ouija board, Tarot cards, etc. get rid of them. Destroy them. There's no need to be superstitious about the process--just burn them along with other trash, or tear them up so no one else can use them. The evangelism arm of the Church of Global Warming, the IPCC, is starting to unravel at lightening speed. The Indian government has announced that it has pulled out of the U.N.'s effort to fabricate a global climate crisis and formed its own scientific foundation to track changes in the Himalayas. Can China be far behind? Pope Al Gore I was unavailable for comment. The Nobel Peace Prize committee is too embarrassed to show its face in public. Of note: GreenPeace U.K. calls on the IPCC Chief Pachauri to resign. When Dominic died in 1221 in Bologna, the city that declared him its patron, his work had already had great success. The Order of Preachers, with the support of the Holy See, had spread to many countries of Europe to the benefit of the whole Church. Dominic was canonized in 1234, and it is he himself, with his sanctity, who indicates to us two indispensable means for apostolic action to be incisive. First of all, Marian devotion, which he cultivated with tenderness and which he left as precious legacy to his spiritual children, who in the history of the Church have had the great merit of spreading the prayer of the holy rosary, so dear to the Christian people and so rich in evangelical values, a true school of faith and piety. In the second place, Dominic, who took care of some women's convents in France and in Rome, believed profoundly in the value of intercessory prayer for the success of apostolic work. Only in Paradise will we understand how much the prayer of the cloistered effectively supports apostolic action! To each one of them I direct my grateful and affectionate thoughts. I can personally attest to the fruits of our cloistered sisters' ministry of contemplative prayer. Their intercessions have helped me, my family and friends, and the friars of my province dozens of times in the ten years I have been a Dominican. For the Order as a whole, our nuns are a Powerhouse of Prayer! If you would like to learn more about our cloistered sisters, check out this link. Complete text of the Wednesday audience. Why is this Canadian premier coming to the US for surgery? The Premier of Canada's Newfoundland province will travel to the U.S. for heart surgery. This choice by Premier Danny Williams should raise serious questions in the minds of Americans who look to Canada as a model for socialized medicine in the U.S. What's wrong with Canada's system of health care that scares the premier? Not only does the premier's choice indicate a serious lack of confidence in the Canadian system, but it also points out the tendency of the rich and powerful to abandon the nationalized schemes of wealth redistribution they support when their own health and wealth is threatened. Of note here is the consistent refusal of Congressional Democrats to require Senators and Congressmen to use the public option they were trying to force on Americans. Majorities in both houses of Congress voted against several GOP amendments requiring Congress to abandon its "Cadillac" health plan in favor of the much touted public-option. In his address to the bishops of England & Wales, the Holy Father challenged the prelates to "recognise dissent for what it is." Too often disguised as "dialogue," dissent endangers ecclesial unity and leads the faithful into serious error. Lest anyone come away with the idea that calling out dissenters amounts to suppressing free speech or academic freedom, we must remember that the Holy Father himself is one of the best examples of how the Church can talk to a secular culture in a reasoned manner with fruitful results. The orthodoxy of the Church is not a straitjacket nor it is a choir for parroting papal talking points. As I have noted many times, a Church that boasts prominent theologians as diverse as Augustine, Bonaventure, Aquinas, de Lubac, van Balthasar, and Congar cannot be labeled an oppressive monolith of fossilized thought. There is a distinction to be made between the Truth of the Faith and how this Truth is understood and communicated. Gregory of Nyssa in the 3rd century believed and taught the truth of the Holy Trinity. Thomas Aquinas, a thousand years later, also believed and taught the truth of the Holy Trinity. However, their approach in communicating this mystery couldn't be more different. Today I wish to speak of the great contribution made by Saint Dominic to the renewal of the Church in the Middle Ages. As a priest of the Spanish diocese of Osma, he was sent on missions throughout Europe, which drew his attention to the need for sound and zealous preachers to bring the Gospel to the people. He was entrusted with the task of refuting the heresy of the Albigensians, who denied the incarnation of Christ, the resurrection of the body and the value of marriage and the sacraments. Embracing a life of poverty, Dominic dedicated himself to the task of preaching the Gospel, and with a band of followers he established the Order of Preachers, also known as Dominican Friars. Adapting the rule of Saint Augustine to the needs of the apostolic life, Dominic placed emphasis on theological study, prayer and community life for his friars. Thus fortified, they would be sent out on missions as itinerant, mendicant preachers. 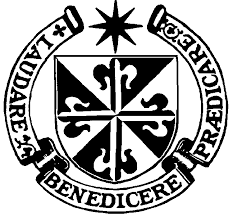 Hence the Dominican motto, contemplata aliis tradere – to hand on to others the fruits of contemplation. One important way in which the Dominicans did this was by promoting the prayer of the rosary, a beautiful means of contemplating, through the eyes of Mary, the truth revealed in the mysteries of the life, death and Resurrection of her son. Some interesting facts about the OP's. . . The Holy Father's household theologian is always a Dominican (there were a few Franciscans thrown in there Way Back When). The current household theologian is from Poland, fra.Wojciech Giertych, O.P. Fr. Giertych is also a professor of moral theology here at the Angelicum. The Holy Father's distinctive white cassock is an adapted Dominican habit. Pope Pius V, an O.P., wore his habit while pope and his successors adapted it for daily use. It is traditional for O.P. friars to wear the full habit--including black cape and hood--while out in the city of Rome as a sign of respect for the Holy Father's distinctive garb. Papal protocol does not allow those in private audience with the Pope to wear white. Only heads of state are exempted. The leaders of the friars--from the Master right on down to the priory's lector--are elected for limited terms. There are no "until death" offices in the Order. There is evidence that Thomas Jefferson was familiar with the Order's constitution and used some of its principles in drafting our nation's founding documents. Thomas Sowell discusses the role of intellectuals in American society. As the last year has conclusively demonstrated being intellectually gifted doesn't necessarily indicate a gift for leadership. If you like a good mystery and ancient Roman history fascinates you, you really can't do better than the novels of Steven Saylor. The murder of peer-review in the ClimateGate scandals. . .an autopsy. Promising to keep lobbyists out of the White House: grammatical nuance. The surest way to become an object of suspicion is to rely on word games to defend outright lies. Tea Partiers battling it out over a winnable political platform. Gotta love American politics! The Dept of Defense is rewriting the rules for Congressional use of military aircraft for personal travel. We can dub these new rules: "No to Nancy and Her Kids Rules." B.O. 's DoubleTalk/DoubleThink: Orwellian rhetoric done by a Master. Stuart Schwartz on K. Olbermann: And so the venom drips, and the ratings sink. Olbermann is cruel to all who, as a class, have rejected him, such as joyful people and women...or people of faith and women...or people with traditional marriages and women...and those with well-adjusted relationships and women. Did I mention women? OUCH! Remind me not to get on Mr. Schwartz's bad side. Dems support campaign finance reform b/c their corporate contributions skyrocketed after McCain-Feingold was enacted. The GOP is made up of Stalinists, right-wing fascists, Khmer Rouge communists, Talibanists, southern segregationists, and Nazis. Wow. And here I thought the GOP had such a small tent. The U.K.'s House of Lords stalls a government bill that would force the Church to ordain women and people in SSM's. The bill isn't dead. Let's call this one: "Liberal Fascist Zombies Attack the Church." First I learn that the GOP is run by Talibanists and Communists and now I learn that it's not gypsies who are stealing babies but BAPTISTS! My world is coming apart. . . The USCCB's point man for the Campaign for Human Development served on the board of a pro-abortion, pro-SSM political group. Ah, now I understand how so much Catholic money got funneled to groups like ACORN. Jesus, once again, riles people up! He's good at that. Like prophets before him, he tells people what they don't want to hear. By proclaiming that Isaiah's prophecy of the coming of the Messiah has been fulfilled in their hearing, Jesus challenges those gathered in the temple to step up and believe that he embodies God's promise of salvation. Instead, assuming that the authority of a majority is sufficient to determine truth, the crowd runs him out of town and tries to lynch him. He walks unharmed through the riot and leaves town. Why do the temple-goers reject Jesus' claim to be the fulfillment of God's promise to send a Messiah? Two reasons: 1) Jesus is a local boy, and we all know that “no prophet is accepted in his native place;” and 2) Jesus' use of proverb, “Physician, cure yourself,” indicates his refusal to perform a showy miracle to confirm his identity. What does he do instead? He does exactly what pastors and preachers are taught in seminary not to do when parishioners get twitchy. He throws down a challenge and a rebuke. In essence, he says, “God's own people have always rejected His prophets, and look at the results. He graces Gentiles before Jews and you people never learn.” Ouch. If Jesus had had a bishop, His Excellency's phone would be ringing off the hook! Remember how often we are told that Jesus is a uniter not a divider, a peace-bringer not a controversialist. He's all about harmony and consensus and living within the tensions of difference. Well, tell that to the screaming lynch mob. They might disagree. Obviously, Jesus lacked the cultured pastoral touch of a postmodern bishop. So, should we look to him and his prophetic style as a model for preaching his gospel? Confrontation has its place in preaching. The prophets of the Old Testament were known and feared for their unwavering commitment to speaking God's message even in the face of torture and execution. Kings dodged them when possible, summoning them to court to answer for their traitorous speech only when necessary. Prophets were notoriously stubborn, self-righteous, and usually disreputably attired. Any one of these three characteristics was enough to warrant royal and public dismissal. Add to the scene the fact that prophets tended to be well-known local boys and you have the makings of a courtly farce. Is it any wonder then that the prophets of old resorted to confrontation when dealing with the cold-hearts and closed-minds of a nation's rulers? Sometimes you have to smash through a wall when the door is barred. Sometimes the shock of hearing the truth spoken aloud is enough to cure the deafness of the worst sinner. And sometimes it isn't. On these occasions, it's wise to get as far away from the condemned nation as possible. Why? Because quite possibly the scariest thing a prophet can say is: “Behold, you will suffer the consequences of your hard heart!” It's time to run. Unfortunately, these days, it seems that every corner, every cable channel, every church/mosque/temple has its own prophet proclaiming the coming apocalypse. Like a flock of squawking crows, these folks fly around the world squeaking and squealing warning us of imminent local destruction and the inevitability of global disaster if we don't change our ways. They have adopted the confrontational rhetoric of the wildest biblical prophet. Do we listen? Some certainly do. Most don't. Confrontation oft repeated quickly devolves into annoying harassment. Those ominous crows start to look and sound like Chicken Little's. What's missing from their squealy prophesying is Godly love, a sincere concern for the good of the whole beyond the immediate personal benefits of power and prestige. What's missing is the divine authority that Jesus himself uses in the temple to announce his arrival as the Messiah. His authority is the power and glory of the most excellent way, the way of sacrificial love. This leads us to the big question of the day: can sacrificial love be confrontational? Anyone who has ever marched in a pro-life demonstration or prayed outside an abortion clinic will tell you that the counter-protesters and the escorts are demonically vicious. For them this isn't just about freedom of choice and left/right politics. They hate us. Passionately hate us. You can expect that groups on opposite ends of the political spectrum to get feisty, maybe even a little rowdy, in the midst of a march. But the bile and venom spewed by pro-abortion activists at pro-life folks goes well beyond the kind of anger that normal politics generates. Why? The choice to have an abortion is intensely personal; it goes to the very core what most Americans think of us their untouchable autonomy in deciding what's best for them. An unwanted pregnancy attaches unwanted responsibilities and necessarily limits a woman's choice of options. But even more than this, pregnancy places a woman in the natural mode of motherhood and all that that implies. At the very core of motherhood is sacrificial love, giving oneself wholly to another. When pro-life marchers remind abortion advocates that the fetus is a person, a being deserving of love, those who would call the killing of this person a moral good react with unadulterated rage. They know the Church is right. And they must cultivate a self-righteous wrath in order to drown out their guilt. The gospel message of love used by the pro-life movement to stubbornly resist compromising with the culture of death shames them into hatred. Denied a convenient salve for their seared consciences, the venom flows and they fall more securely into demonic hands. It should be shockingly clear to the Church by now that our best witness to the culture of death is sacrificial love. Paul writes, “Love is patient, love is kind. . .it does not rejoice over wrongdoing but rejoices with the truth. It bears all things, believes all things, hopes all things, endures all things.” With some we can reason. With others we can demonstrate. But some we must simply love. Bearing up under the burden of hatred, believing solely in the power of mercy, hoping in the promises of the Father, and enduring insult, persecution, and trial, the Church must not be satisfied with merely presenting the truth of the gospel, flashing cue cards and murmuring sound bites. What will heal a seared conscience cannot be logically deduced and crammed onto a bumper sticker. Slogans on placards are easily refuted by other slogans on placards. What cannot be refuted is an act of love done in sacrifice, a willing act of surrender done so that another might be see the truth. Paul reminds us what we know by faith, “Love never fails.” Even as the prophet feels the sword cut into his flesh, he knows that he has succeeded in touching a conscience burned by hatred and malice. His persistence in telling the truth is not ended by death but rather vindicated by it, shown to be the undeniably divine power it truly is. When he proclaims to the people in the temple that Isaiah's messanic prophecy has been fulfilled in their hearing and subsequently chastises the crowd for their unbelief, Jesus causes a riot. He holds up before the people their dishonesty, their faithlessness, their charred consciences. He shows them that they know he is telling the truth and yet still refuse to hear it spoken. For them to believe such a proclamation changes everything-- uproots centuries of tradition and belief, revolutionizes everyday life, forces them to make a choice and live by it. Rather than surrender, they riot and pour out the hatred and malice of those who have seen the corrupted state of their souls. How does Jesus respond? He dies on the cross for them. If we will be his Church, we must be prepared to do nothing less. The march for life is a march to the cross. . .not for ourselves but for those who will not see, will not hear. Two generous HancAquam readers have used the BDWL to sent me two books. First, books do not disappear from the Wish List once purchased as they do on the Amazon Wish List. I only discovered this today when a book arrived as a very pleasant surprise. So, please, let me know if you buy a book so I can delete it from the list. Second, also unlike the Amazon list, the BD list does not automatically include my shipping address when you add a book to the shopping cart. I tried to include it in the notes that accompany each listing, but these notes only appear when I sign into the account. My shipping address is at the bottom of this site on the right. I've contact BD about both of these issues, but they have not been able to help me out. . .yet. Virtue & Vice: what's yours? Virtues are good habits. Vices are bad habits. Virtues help us to become the best version of ourselves that we can be. Vices prevent us from doing so. What do you consider to be your single best virtue and your worst vice? My Best Virtue: I am an unrepentant idealist when it comes to doing the right thing. My Worst Vice: I am stubborn beyond reason. Yes, the two are directly related. This is not the Science we are looking for: Climate data "tampered with," "useless for determining accurate trends," "skewed the data," "gravely compromised," "contamination by urbanization," "cherry-picking of observing sites," "data are missing and uncertainties are substantial." B.O. bows to the Mayor of Tampa, FL. In fairness to The One. . .a psychologist friend of mine once observed that I tend to give everyone I meet a little bow upon introduction. I notice it now every time it happens. Maybe I was a Chinese peasant in a past life? Medieval justice: trial by ordeal may have been just what the Judge ordered. Dividing the shepherd from his flock: lay folks don't always agree with the Church's political positions. Fortunately, bishops are under no obligation to poll the pews when teaching the faith. Will Protestant clerical converts to the RCC be the answer to our vocations problem? No, they won't. They will certainly be a welcomed help, but the numbers aren't there. The answer to the Church's vocation problem is for young called to priesthood to find the courage to say Yes to their call. A father's application for young men to date his daughter. I should send this to my poor nieces. Their father's version begins with threats of torture and death rather than promising them for later on. Dihydrogen monoxide: sign the petition to ban this dangerous substance! Computer technology assist the morally weak in making those tough decisions. 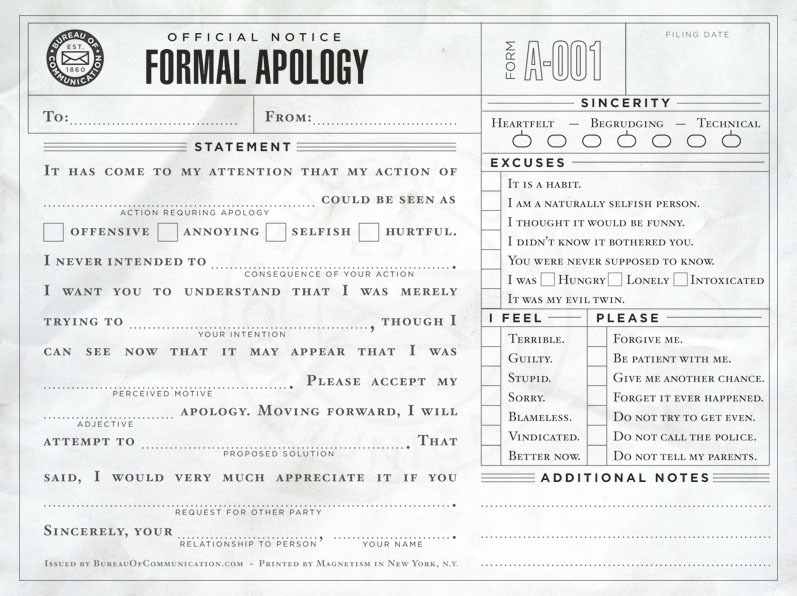 Formal Apology template. . .I printed out 500 of these. It's been a tough month. A philosopher vs. a genie: who wins? Need a sign that the Pro-life movement is winning the culture war? Pro-abortion feminists don't want Super Bowl fans to know that Tebow's mom CHOSE to give him birth. Now, why in the world would a group of self-identified pro-choice abortion advocates try to prevent CBS from running this ad? Hmmmmmm. . .maybe b/c they are afraid that it might cut into their child-killing profits? Bad for business, ya know. Just maybe. The gift that keeps on giving and giving and giving: Climate Gate. Glacier extinction predictions were lifted from a grad student's master's thesis. Where did he get the numbers? A perfectly scientific and impeccably reliable source: ski instructors. So, the U.N. spent millions on a conference whose single-minded goal was the extortion of billions from first world nations in a wealth redistribution scheme based largely on the guesses of snow bunnies. Wow. Settled science, indeed. While back on the farm. . .record cold temps and snow in the south. Everyone knows the Dominican's unofficial motto: "To Praise! To Bless! To Preach!" Here's another one: "Never trust a skinny Dominican." Apparently, the voting public is getting the message about skinny politicians? Of note here is OP laymen, Tom K's own version of the unofficial OP motto: "To Praise! To Dine! To Preach!" Are we getting tired of Olberman's televised fits of faux outrage? I am. . .and I've never watched him. Laws banning cell phone use while driving seem to be having little effect on road accidents. Who cares? Drivers talking on cell phones annoy me, so punish them! Oops. . .the Bush/Cheny War Criminals meme is going up in flames. B.O. 'fesses up on health care options. . ."Ummmmm, well, no you can't keep your current health insurance." We knew that, Mr. President. How? Because you said we could. Free-thinking atheists mime concern for freedom of religion by protesting against a postage stamp: "Mother Teresa is principally known as a religious figure who ran a religious institution. You can't really separate her being a nun and being a Roman Catholic from everything she did," [atheist] Gaylor told FoxNews.com. And, of course, that's the real reason for the objection. Can't have people thinking that the Catholic Church is a force for good. Global Warming hoax science? $1,000,000,000,000,000. Proven Moon Mission science: $0. B.O. 's promise to honor science over ideology: cheap.